Plot: James Bond becomes the target of a winner-takes-all manhunt as SPECTRE place a 10 million Swiss franc bounty on his head. Someone wants James bond's head on a silver platter, literally. All you have to do is deliver Bond to one of the most sinister criminals in the world, and earn ten million Swiss francs for your trouble. But there's stiff competition. And soon 007's motoring holiday turns into an odyssey of treachery as he becomes the target in a winner-take-all manhunt. Many have tried; few have succeeded. Not even James Bond's most desperate adversaries, not even all the global resources of a SMERSH or a SPECTRE under the diabolical leadership of Ernst Stavro Blofeld or, in more recent days, Colonel Tamil Rahani, have managed to defeat 007. But is it because no one has discovered 007's soft spot? It all starts innocently enough: the suave James Bond is on leave in Europe, motoring across France in his Bentley Mulsanne Turbo on his way to visit friends in Italy, then to a sanitorium in Austria, where his devoted housekeeper, May, is convalescing from a serious illness. Soon enough, however, ominous events begin to take place: Sudden death strikes at least four people who come close to Bond during his journey. Coincidences? Perhaps. But is Bond's encounter with the wealthy and beauteous brown-eyed Sukie Tempesta, known as "La Principessa", or her cohort, the equally charming "Nannie" Norwich, who heads the world's only female bodyguard service, truly a coincidence? Then a phone call comes, from May's doctor at the sanitorium: Bond's housekeeper has been kidnapped, and with her a familiar visitor, M's secretary and Bond's longtime (if discreet) admirer, Miss Moneypenny. Soon enough Bond realizes what has happened. There is a contract out in the espionage world: ten million Swiss francs for James Bond's head literally severed and delivered on a silver charger. The donor: none other than Tamil Rahani himself, who was last seen (in John Gardner's Role Of Honour) plummeting from an airship in Lake Geneva. 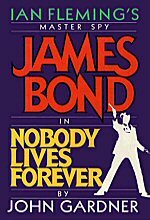 Nobody Lives Forever is vintage Bond and the best of the best selling cycle of James Bond novels created by John Gardner, which began with Licence Renewed, Told at a breakneck pace, marked by unforeseen pitfalls and twisting turns that confound Bond as much as his readers, it propels us from the winding roads of the Tyrolean Alps to a shark-defended island off the coast of Key West and a locked room that contains but a slant-bladed device long favoured by head-severer's: the guillotine. 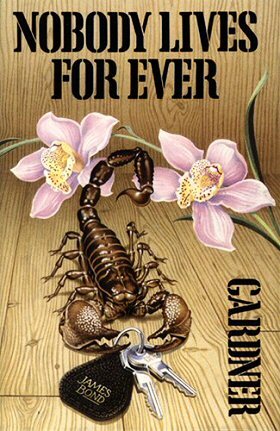 Filled with double-crosses that will throw off even the most seasoned Bond hand, this is high-tech, high-tension thriller writing at its very best, proving once more and for all that Nobody Lives Forever. Top Left: British 1st edition Coronet paperback. Top Right: American 1st edition Charter paperback. Bottom Left: American 1st edition Putnam hardback. Bottom Right: Canadian 1st edition Coronet paperback. Taking a deep breath, he raised the ASP. He was only a few steps away from Rahani's head. One squeeze of the trigger and it would be obliterated, and, with luck and cunning, he could be away - hiding up in the grounds - until he found a method of getting off the island. He began to squeeze the trigger, and as he did so thought he felt a small gust of air on the back of his head. "I don't think so, James. We've brought you too far to let you do what God's going to do soon enough." The voice came from behind him. "Just drop the gun, James. Drop it, or you'll be dead before you can even move>" He was stunned by the voice. The ASP fell, with a noisy thump, to the floor and Tamil Rahani stirred and groaned in his sleep. "Okay, you can turn around now. I'm sorry it had to be like this, James. You lived up to your reputation." "Not as sorry as I am." Bond allowed himself a smile.. Author John Gardner apparently concocted the plot based on feedback from his friends when asked what they would like to see in the next adventure: a personal story won over a regular spy mission. 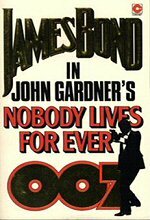 The book was given the working title "You Only Die Once" by Gardner, a play on Fleming's opus "You Only Live Twice". Regular first edition artist Richard Chopping again provided the cover, but this was his last in the Bond series. 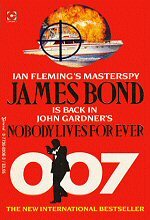 As Bond drives across Europe to collect May from Klinik Mozart, a nursing home in Austria, violence continues to surround him. Bond doesn’t believe in coincidences, and it turns out when he gets in touch with London that a price of 10 million Swiss Francs is on Bond’s head if it can be decapitated. Bond suspects the involvement of SPECTRE and its dying leader, Tamil Rahani. Bond hides in Strasbourg with Sukie Tempesta, whom he earlier saved from a mugging. Bond decides to use Sukie as a hostage, and escapes Strasbourg after Italy’s SIS man, Steve Quinn, has told him the whole story. But meanwhile May and Moneypenny are kidnapped. Bond also picks up Sukie’s friend, Nannie Norrich, who turns is head of a bodyguard agency and helps defend Bond from attacks on the way to Austria. In Austria, 007 is captured by ‘Der Haken’, a bent police officer, but someone kills him and his four cronies and allows 007 to escape. Bond then goes to the Klinik and rescues Dr Kirchtum from three villains, one of whom is Steve Quinn who Kirchtum injects to keep him asleep. All leads point to May and Moneypenny, for whom Bond’s head is the ransom, being in Key West. Bond flies to Miami but still distrusts the two girls, who seem to have saved his life too often and who he thinks may be keeping him alive for SPECTRE. But on landing 007 is captured by Kirchtum and Quinn, but escapes on transportation to SPECTRE’s island base when Nannie and Sukie kill the two traitors and their captain. Mistrusting the girls, Bond journeys alone to the island, but is caught by Nannie Norrich on the way, and locked up by SPECTRE. He is shown the guillotine with which he will be executed, but soon starts an escape plan. Using Q gadgets which evaded Nannie, Bond rigs up Tamil Rahani’s bed to explode when it is moved into position to see Bond’s execution. 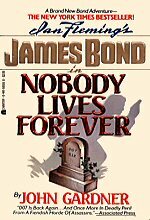 With Bond about to die, Rahani is blown into a million pieces, and Nannie is locked in the burning room with the other henchmen after Bond sends the guillotine down and chops off her arms. Bond escapes an frees May and Moneypenny from the cells, helped by soldiers who were alerted by Sukie who outwitted Nannie’s attempts to poison her and alerted the police.